The third installment of MASS DESTRUCTION METAL FEST will take place November 1st and 2nd at The Loft at Center Stage in Atlanta, Georgia and include performances from NILE, SIGH, DEMOLITION HAMMER, TERRORIZER, NUNSLAUGHTER, THANTIFAXATH, DECEASED, and more! 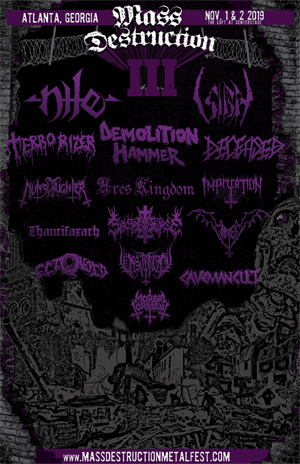 An annual two-day, single-stage, all-ages event, MASS DESTRUCTION METAL FEST was conceived by Atlanta metalhead Cody Martin in 2016 and established in 2017 with the help of local Atlanta promoter Amos Rifkin (A Rippin Production). A festival created for fans by fans, previous lineups have included some of extreme metal's most esteemed acts including DEMONCY, MACABRE, NOCTURNUS AD, MORBOSIDAD, SADISTIC INTENT, and more. Offers Martin of this year's lineup, "Coming up on our third year and having it still being a fun and exciting adventure for me is a pretty awesome feeling. I still can't believe we have SIGH coming in from Japan. I'm also going to go bonkers when DEMOLITION HAMMER plays "Skull Fracturing Nightmare"!" Adds Rifkin, "This year, we took several huge steps forward, and we are extremely pleased with the level of lineup we've been able to assemble in only our third installment. Response has grown exponentially each year, and I'm overjoyed at the amount of friends planning on making the trip to Atlanta this fall!" The Loft at Center Stage, located in midtown Atlanta, is a seven-hundred capacity venue conveniently located near lodging and public transportation. In addition to a crushing lineup, the fest will include a special merch room featuring tables from a host of reputable heavy metal festival vendors. Interested in vending at this year's event? Email massdestructionproduction@gmail.com. View the MASS DESTRUCTION METAL FEST III trailer below.